This multi-function recliner has a soft, casual look that makes it the perfect piece for your comfortable, laid-back home decor. 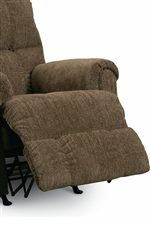 With the capability to rock softly back and forth and swivel from side to side, this recliner allows you to chat with friends, watch TV, read a book, or take a nap while softly pillowed atop our plush, high-resiliency foam cushions. This exceptional recliner is equipped with our ZERO GRAVITY™ mechanism, which gently supports the neck, back, and other high stress areas when you recline. Power recline is available on this chair for additional charge. 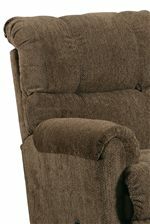 The Griffin Casual Griffin Rocker Recliner With Swivel by Lane at AHFA in the area. Product availability may vary. Contact us for the most current availability on this product. For advanced comfort and the best in motion furniture technology, the Griffin collection from Lane Furniture is an outstanding choice. Plushly upholstered in extra-thick, high-density foam back and chaise cushions, your frame will be softly enveloped as you lay back and lounge in these recliners and reclining sofas. Our ZERO GRAVITY™ mechanism supports legs, back, and neck to reduce stress and softly cushion the body when you recline. Additionally, the Griffin collection makes optimal home theater seating; our spacious reclining sectionals and reclining loveseat with drink holder console easily allow you to watch your favorite films while you stretch out and enjoy drinks and popcorn. Lane Furniture guarantees that the furniture from the Griffin collection is made with the highest quality raw materials right here in the U.S. 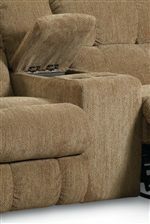 The Griffin collection is a great option if you are looking for Casual furniture in the area. Browse other items in the Griffin collection from AHFA in the area.